Pasco Sheriff Chris Nocco said the death by suicide of a deputy attracted a large media contingent to the Sheriff’s Office that might not otherwise have been there. Suicide, however, is a communitywide problem, Nocco said. Her colleagues became concerned about Deputy April Rodriguez when she did not report for duty. They went to her residence on Feb. 24 and discovered she had taken her own life, according to Sheriff Chris Nocco. NEW PORT RICHEY -- A somber Sheriff Chris Nocco called Monday afternoon for people to pay more attention to the problem of suicide as he was announcing that one of his deputies had taken her own life. Rodriguez’s death is the first instance of a successful suicide by anyone within the Sheriff’s Office that anyone on the law enforcement agency’s command staff could recall. Rodriguez, Nocco said, was assigned to the Sheriff’s Office District 3 patrol unit, which covers the Trinity-Holiday area and the State Road 54 corridor. 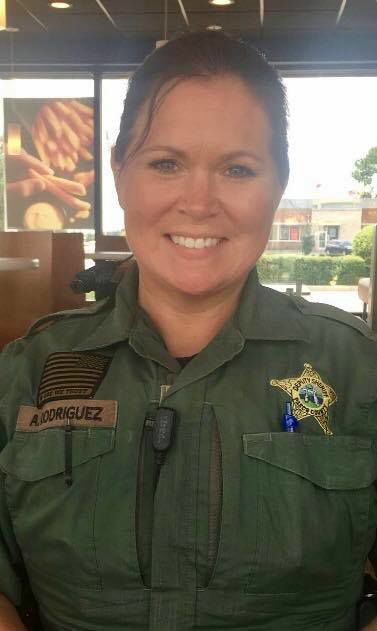 The Sheriff’s Office command staff met Sunday with the other members of the District 3 patrol team to tell them of Rodriguez’s death and the deputies were “heartbroken,” Nocco said. Nocco urged the media to respect the privacy of Rodriguez’s family, which includes two minor children. The sheriff said he had spoken to the deputy’s husband about her death. Rodriguez became the subject of concern over the weekend when she did not report for her scheduled duty. Sheriff’s Office personnel went to her residence on Feb. 24 and when they looked inside and saw her foot, they assumed she was having a medical emergency and alerted Pasco Fire Rescue. They then entered the residence and discovered that the deputy was dead. Members of the Sheriff’s Office have various means of counseling and support available, Nocco said. The Sheriff’s Office, he stressed, does everything it can to ensure that its employees receive private emotional or mental health counseling. The sheriff, however, said he did not know if Rodriguez had sought help from any of the agency’s employee assistance programs. “I don’t want to know,” he said, because such information is private.